This is the 8th entry in our series of reviews of “SEO Checkers,” online tools that allow you to plug in your website address and have the tool check for areas of poor search engine optimization. Our latest entry is one of the nicest tools we’ve checked so far. The video review will walk you through the tool and I’ll show you things I like (quite a few) and things I don’t like (not very many) for this tool. 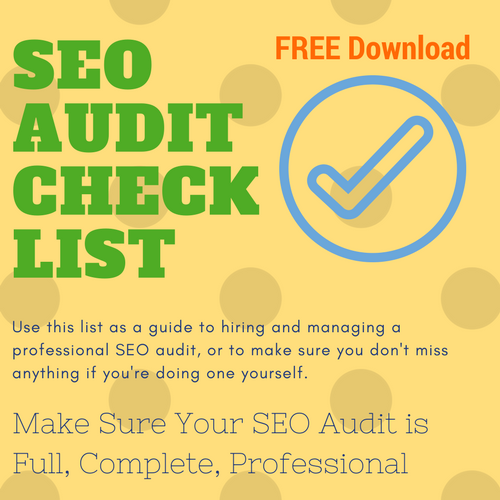 If you’d like a free SEO audit checklist, just like the one we use for our professional in-house SEO assessments, we give you a chance to get one here. If you’re the type of person who would prefer to skim text, beneath the video is a full transcript of the video. Please let us know how you like it, or suggest other tools you think we should review, in the comments on the video or the blog. Hi. I’m Ross Barefoot with Horizon Web Marketing. We’re about to get started with the next in our series of tool reviews for free SEO checkup tools. Stick with me. I’ll be back in just a second. Hi, and welcome back. As you know, we’ve been working through a lot of free SEO tools that do a site analysis or a checkup on the SEO of your website. We’ve done quite a few in this series, and as a matter of fact, if you look down below in our playlists, you’ll see a playlist that is all of the various tool reviews that we have done so far. Make sure that you check those out. Also, I’m going to ask you right at the front, just in case you nod off during the video, please go ahead and subscribe to our channel. This gives Google an indication that the channel has some value, and we think it does. We hope you do too, so hit that Subscribe button. If you like this video, also hit the Like button, and that’ll make sure that YouTube and Google show it to more people. In any case, let’s go ahead and get started with this particular tool that we’re looking at today. As you can see on my screen, what I’m showing is the website for the company that produces this tool, and I’m not really familiar with this company. They’re in the UK, and the name of the company is Silktide. Obviously, as they say, their business is in helping companies to come to grips with their websites and SEO analysis and so forth. They have a free tool that they offer, and this is where it’s located. It’s at nibbler.silktide.com. You can see Nibbler at the front. This is their free tool. They also have a Pro version of this tool, and I’m sure that’s the one that you hope you will, that they hope you will buy once you try out their free check. It’s actually a pretty cool tool, and one of the coolest things starts right off in the sense that you don’t have to give them an email address in order to try it out. We’re going to go ahead and put it through its paces. We’ve been using this particular website that you see on screen. Very plain, very boring. It’s sort of a demo site that we use for this. It’s called Artisans of Colorado. It’s not at all professionally optimized. As a matter of fact, I’ve deliberately deoptimized certain aspects of this particular website so that we can perform these checks and have something we can work with. What we did is, we went to Nibbler, and we plugged that website in and generated a report. Once the report comes back, it takes a little while for it to generate, and it comes back looking like this. Really like their interface. It’s clean. It’s easy to use. Over on the right, you have the various sections of the report. They have a numeric grade that they give you. If you’re wondering how that numeric grade is composed, they’ve got a little overview over here on the left, so you can see like the accessibility grade. They’ve got a numeric rating on each of some subsections within that particular section of the website. I like how things will expand and contract very quickly, and they’ve got some really good advice. As you drop down through their site, you can see they’ve got top priorities for website improvement. They’ve got links to read more material. They emphasize, right at the top, social media, and so that’s what they get started with is, just start scrolling through the interface. Now, I’d like to stay at the outset, but this tool is definitely not going to give you a complete audit, but we’ve checked half a dozen tools so far. None of them give you a complete audit, a complete SEO audit. Each of them will check certain aspects of your site. Nibbler is no exception. It’s not going to be complete, but what it does, it does pretty well. Let’s start out and just take a quick look at some of these sections. It’ll take a look, first of all, at your social media, and in this sense, it looks at whether you have a Facebook page that it can find or a Twitter account that it can find. If you drop down here, it’ll also check for any indications that there have been some social shares of the website. Now, the one thing that, and I’ll go through and I’ll tell you some of the things that I fault about this tool and a lot of things that I really like about it in a general sense, one of the things that I do fault, and it’s a fairly minor fault, is that sometimes the organization of the various things could leave something to be desired. For example, when it comes to social media, they mix in this little rating here for Alexa. All right? It shows this Alexa ranking, which is really, doesn’t have anything to do with social media, so I don’t know why it’s sandwiched in between the analysis of a Twitter, or looking for a discovery of a Twitter account, and social shares. You’ll find that, in a number of different places, there’s kind of this curious organization that doesn’t make a whole lot of sense. Let’s drop down, though, and see where they start out. Here, and the very next section is sort of like that. The next section goes into meta tags. Usually, these tools will rank your title and your description tag all in the same area, because the title tag typically is what shows up here in a search engine result. This is, would be a simulation of a Google result, and the description tag, the meta description tag, is usually what shows up as the description in the snippet. I like the fact that they have a preview of what a search snippet might look like, and I like the fact that they will not only check the page I plugged in for a meta description tag, and for a number of other things. They’re also checking proactively for the randomly selected pages within the site. Notice they’re telling me here that these pages below that they’ve checked have no meta description. That’s a very important heads up. If we go down a little bit farther, you’ll notice that it also gives me a review of other meta tags that show up within this page. Now, unless you know a little bit something about HTML and web design, this may not do you a whole lot of good, but it is good to be able to reference it. Notice how they also have multiple pages, so they’ve tried to keep a clean design by only showing you certain tags, and then within that block, you can go to a page two and a page three to see other meta tags. I think that’s nicely done. It’s a good interface. I like this content designation here. It tells me whether I have thin content. That’s Google’s word. Thin content. In other words, not a whole lot of textual content on the page. It gives it to me in this nice little sort of speedometer, tachometer type of representation, which is good, because the amount of content you have is a little bit on the subjective side. Then if you look down below here and we expand it, you’ll see that it gives me the number of words of textual content on the other pages it’s checked. I really like that aspect. Content is extremely important. Most of the tools don’t do something like that. It’ll give me some indication as to whether it has the requisite pages on the server. It’ll also talk to me a little bit about internal links. I’m not crazy about this particular section, because it makes a recommendation I don’t necessarily agree with. Namely, that you should always have text in your anchors. An anchor is a link to another page, and the anchor text is the text that you click on. Yeah, it’s a good idea to have relevant text that people can click on and that describes the link, but there are many situations where you don’t need to do that, so I have a little bit of a quibble for giving that a red circle with a white X in it. Now, down here under Headings, it gives me a keyword cloud, which shows the relative importance of certain words that it’s discovered within the headings or the H tags of these five pages. This is a great way to visualize where you’re either weak on content or you’ve emphasized the wrong content. This is a website, for example, for artists and artwork, and you’ll notice that the word that comes up the most is the word “recent,” which has nothing to do with our topic. That would need to be something that, from a content strategy, we would want to look at. We’ll scroll down here, and let’s see. It says, “Some pages did not define headings correctly.” This is a correct observation, because headings are often not used correctly on webpages. Headings should be in a hierarchy with one single H1 tag on a particular page. Now, it doesn’t tell me that right here. It doesn’t tell me that there should only be one H1 tag that’s the prime top-level heading of a page. This has two H1 tags, and it really would have been best if it flagged me as that not being, that that was not according to best practices, but the fact that it shows it in a hierarchy is a good thing, and they emphasize that also when it comes to their recommendations. Let’s keep it moving here. I don’t want to keep you here too much longer. They give you some heads up about some images. It gives you information on the domain age, URL formats. I’m going to drop down here. I like the incoming links. They show number of links and number of domains. One thing I’d like to comment on that I really find to be refreshing is that they give the source of that data. A lot of these SEO checkers won’t tell you what the source is, so this is Ahrefs. A lot of people just call them hrefs, and they’re basically a service. There’s one of the most reputable in the SEO industry. They are used by tons of SEOs. It tells us that they’re using reputable information for this. We go down here, there is one bug in their interface. It says, “Page titles,” and it reports correctly that all of the pages they checked do have defined titles, but notice here it says, “No Title,” “No Title,” “No Title,” in the breakout of pages, and that is incorrect. Probably a bug that their development team is already working on fixing. They show that there’s analytics on the site, and even give a call out to the fact that it’s using Google Tag Manager, which shows that it’s fairly recent. That is the construction of the tool. Then freshness, they basically just look at the last modified date on the various pages in order to give you an idea. This is not that great of a metric, because often, pages can be modified in ways that don’t really matter, but it does give you all the various states for all the various pages it’s found and that you’ll basically do more than just the pages that are in the review. Now, this is at the end. It’s giving basically a little advertisement for their professional level Silktide Insites. I’d have to say if I was in the business of buying tools like this, I’d be very interested in their professional level tool based on my favorable impression of their free tool. However, we’re, this series of reviews is basically just taking a look at free tools, so we’ll stop with this one. Now, let’s jump over real quick to the tale of the tape, so to speak. We’ve been lining up the various SEO checkers that we’ve been reviewing, and we’ve been taking a look at the internal SEO audit checklist that we use as a team. When we’re going through a site and doing a full SEO audit, we check a total 91 items, and that number tends to grow as SEO becomes more complex. You’ll see that Nibbler would help us to have cleared a total of sixteen out of 91 of those items. That seems like a really low percentage, but you can see here Google’s own tool, Lighthouse, only helped us clear six of the items on our checklist. HubSpot’s Website Grader only cleared two, so Nibbler tied for second so far in the number of items on a full-blown SEO audit that it helps us clear. That’s it for our review or our quick walkthrough of the Nibbler tool. Overall, I’d say this is one of the nicest tools I’ve looked at so far. It says a lot of good things about Silktide, the company that produced it. Personally, at some point, I might like to check out their Pro level tool, because this was a pleasant experience. In the meantime, if you have a tool that you’d like us to check, please go ahead and put it in the comments. If you’d like to ask us a question, put it in the comments. We’ll be glad to answer your questions, or if you just have an observation. Like I said at the outset of the video, please, if you find this useful, and even if you don’t, go ahead and hit the Subscribe button and the Like button, and we’ll be looking forward to presenting more what we hope to be very useful SEO and digital marketing videos in the near future. Again, my name is Ross Barefoot. Glad to have you join me for this walkthrough and hope to see you next time. Bye for now. By virtue of its position as one of the major players in digital marketing, Hubspot’s SEO checkup tool, the Website Grader, has been used to do an SEO check on literally millions of websites. In this review I take you through the results of a check I did as part of our ongoing series of reviews of free website analyzers. How does Hubspot’s Website Grader stack up? Watch the video here and find out. And, in case you’d prefer to to read, we’ve included a full audio transcript with screen captures below the video. Hi there. Do deep pockets make for a great SEO check up tool? We’re going to find out in just a minute. Hi, I’m Ross Barefoot, with Horizon Web Marketing and the Horizon Web Marketing Academy. We’ve been working through a series of free online tools that’ll help you do an SEO check up on your website. Now these SEO checkers are pretty common, there’s a lot of them out there, and many of them are made by small teams of developers, laboring away, sometimes more of a labor of love than anything else, and we’ve reviewed a number of good tools. This time we’re going to turn our attention to a tool developed by one of the big companies out there, a company named Hubspot, that you may or may not have heard of. Hubspot is a major player in digital marketing. They’ve got a great platform for marketing your business. 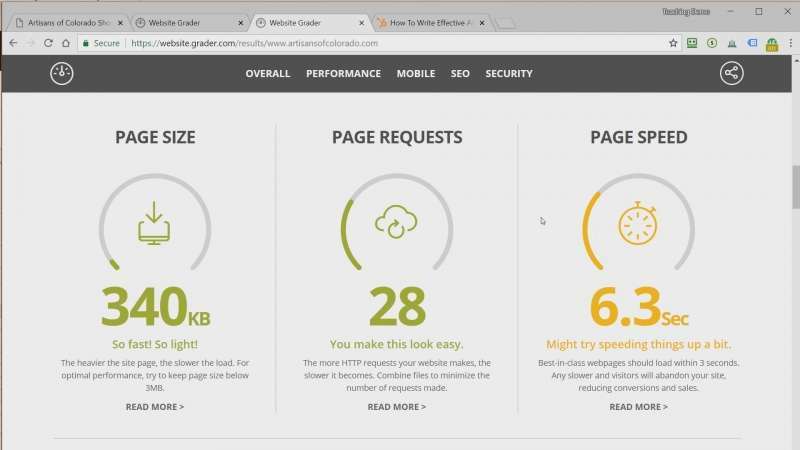 I can’t really review the platform here, but they also have a lead magnet tool, that is a tool designed to generate interest in their business, called the Website Grader. So we’re going to take a look at that tool and see, okay, this was developed by a company with deep pockets, does it show up in their free SEO checker? So let’s have a look. When you arrive at the website, you know that you’re dealing with a heavy hitter here because their domain is “grader.com.” That’s a pretty high end type of domain for a company to have, and they’ve got “website” as the sub domain, so it reads website.grader.com. 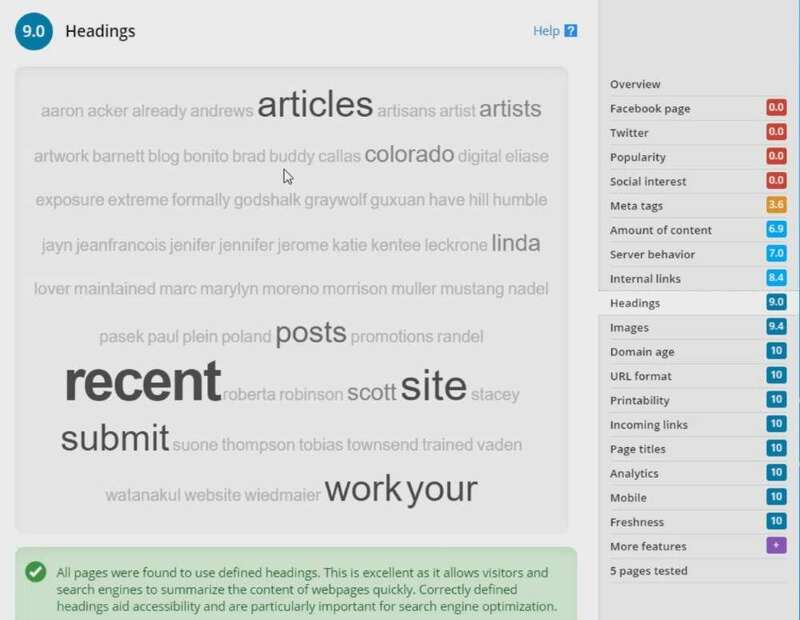 You can see it’s powered by Hubspot at the top, very simple interface. It asks, “how strong is your website?” It asks you to put in the website and they also want your email. Hubspot is great for being out there and trying to build their email list. And I’d first like to point out that Hubspot offers lots of great content online. And so I certainly, nothing in this review should detract from the fact that they’ve really made some positive contributions in the world of digital marketing. 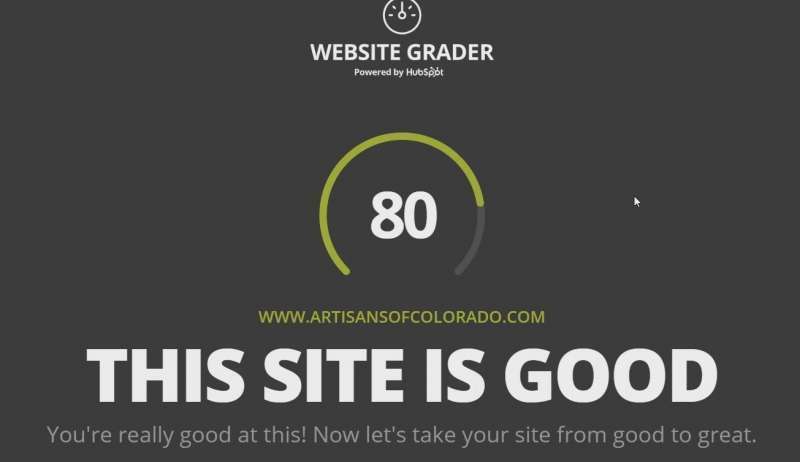 Now we’ve been running a website that we’ve been using as kind of a test website, called Artisans of Colorado, and as you can see, it’s pretty plain. This is what it looks like. And it has not been optimized for search, as a matter of fact, we’ve thrown some errors in there just to see if some of these tools will pick up on the errors. So here’s the report that I get when I run artisansofcolorado.com through Hubspot. It tells me that my site is good. That really makes me feel great. It registers it as an 80. 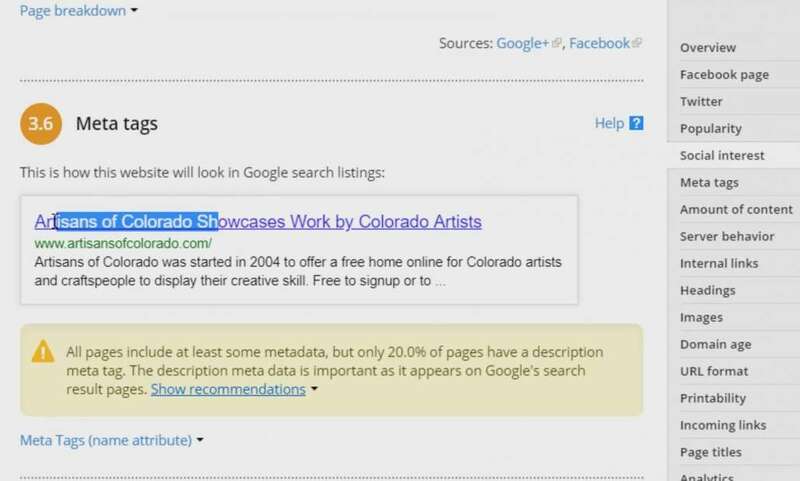 The thing is as someone who’s done SEO for well, going on forever now, since 2002, I can tell you there is no way artisansofcolorado.com deserves an 80 on any scale in terms of search engine optimization. Let’s take a look at what they’ve talked about here. Says that my performance gets a 20 out 30, my mobile readiness gets 30 out of 30, the SEO gets a 20 out of 30, and security 10 out of 10. Then it gives me a screen capture and then we start to get into some of its results. Now one thing that probably some of you might like, I personally get tired of and that is, they really indulge in a lot of cute descriptions here, so some copywriter went to town on the informal side of things. But I find this tool to be probably the least useful of any tool that I’ve tested so far. It gives me very little data. I’ll give you one example here, it’s showing me my page speed is slow, it’s just giving me an overall number rather than breaking down into the things that Google looks at like when does the page first start to render, when do people first start to see it as opposed to when it completely loads. Very basic metrics. Not enough detail to really tell you whether your site is truly slow, and if it is, what to do about it. The other thing is they tell me that I might try speeding things up a bit. If I click on any of those links to read more, I’m expecting to see some details associated with that, like what specifically I could improve, and instead it just takes me to a very general blog post, and that’s the case with all of this stuff, like page request, page size and so forth. When I drop down here it’ll tell me that I need compression. It’ll tell me that I’ve got some render blocking going on. So it gives me some information, but not really enough. I’m going to have to find another tool to really tell me what to work on with this site. It will show me that the site is responsive, and this is what I mean by cute, they say, “now that’s a good looking viewport.” You know after a while I probably would rather just have the information than have it expressed in that particular manner. When I drop down here to SEO, they’ll just take a look at like the very most basic of things, does it have page titles, they’ll give me a yes without showing me what the page title on this page is. Same with meta description. And one of the things I was a little disappointed at, because Hubspot is really great at producing content, like when I clicked on read more for the meta description tag it takes me to this that’s showing me a capture of a search engine results page from like five years ago. You see the little picture here of Ramesh Ranjan up in the left, that type of search snippet hasn’t been seen in a long time, so this is a pretty old page and with something like a meta description tag as they’re talking about here, Google has just in the last six months changed their specifications on that title two different times, so it’s really important to have more current information. When I drop down I see on security, it just basically tells me that I have a secure site, so that’s good. When it says what should I do next, it’s a pretty short list, four different items. And then they’re basically of course offering me a trial of their software. By the numbers: Website Grader comes up very low. Not many audit items can be checked off with this free tool. Now, we have been comparing these tools to our SEO audit checklist and one of the things that we do at Horizon Web Marketing and the consulting side of our business is we will do SEO audits on sites and they’re typically pretty thorough, so we’ve taken each of these tools and we’d say, okay, if I’m using this tool, will it help me to clear a particular item on our SEO audit checklist? So the SEO audit checklist here has a total of 91 different items, and the Hubspot website grader is showing here as having been able to help me clear two out of 91 of those items. That’s about the lowest score that I’ve seen, well it’s definitely the lowest score that I’ve seen. I’m just going to scroll down here through some of the items on our checklist. It was able to tell me that it’s using HTTPS or a secure protocol. It was able to tell me that the site is mobile friendly. But as far as everything else on our audit checklist, it was not able to help me out at all. So in terms of using the website grader to actually do an SEO check on your website, I’d say choose one of the other tools that we’ve been looking at. That’s not to say anything disparaging about Hubspot’s platform or any of the other things they offer, and as I’ve said before, I really appreciate all their great content, but this particular tool really is not going to be very useful whether you’re experienced or inexperienced in terms of SEO and digital marketing. Get your own free copy of our SEO Audit Essentials Checklist. 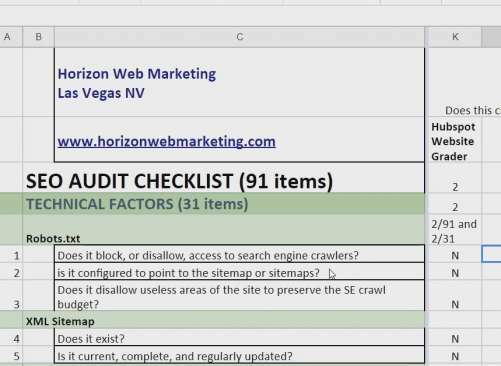 Now that SEO audit checklist that I showed you online, we do offer as a free resource, and I’m going to put a link down in the description of this video where you can click through and get a copy of that checklist for yourself and start working through it. The checklist also has links to videos and other instructional materials to help you to be able to do some of the checks that we have on our SEO audit checklist. Also, please subscribe to show your support for our video production and the fact that we’re trying to create content that’s useful for business people out there who are trying to do SEO on their own. So just go ahead and click that subscribe link if you enjoy content like this. Also, please let us know if you have any consulting or SEO training needs. We’d be glad to help you out. Again, my name is Ross Barefoot with Horizon Web Marketing and the Horizon Web Marketing Academy, and I’ll see you next time.